Just What I Needed: A Pick-Me-Up! 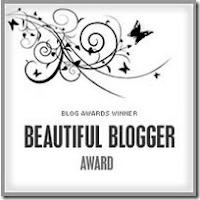 My dear bloggy friend, Debby, passed this Beautiful Blogger award over to me! Thank you, Debby! Debby blogs at Just Breathe and For Your Tears. She is my most faithful reader! As part of receiving this award, I need to list 7 things about myself. I’m a PK–Pastor’s Kid. I grew up in three different parsonages. I hate the taste of watermelon. My family doesn’t understand. I try a small bite every summer…I still hate it. I love anything lime: lime margaritas, key lime pie, lime sherbet; if it’s lime, I love it! A local restaurant by my house when I was in high school made lime sundaes; Limelight was my favorite lotion at Bath and Body Works. I was so sad when they discontinued it! I loved being pregnant. I had the perfect pregnancies; no morning sickness, no complications, and healthy babies! The C-sections I had, however, were horrible. I was an elementary school teacher for thirteen years before I became a stay-at-home mom. Now I’m a Sunday School teacher, and I’ve been the VBS director at my church for three summers. I’m also the publicity/newsletter editor of my MOPS group. My name is not really Ginny Marie. (See the note in “About Me!”) My kids and husband also have nicknames on this blog; I find it’s easier to use real names as nicknames rather than always typing “Daughter 1” or “Youngest.” (See, I’m not that clever thinking of blog names for my family!) I have been known to call my daughters by their blog names before! I always feel guilty, though, when readers assume that those are our real names. All the stories and opinions I write, however, are true! Thank you, Debby, for thinking of me when you were passing out this award! 7 Responses to Just What I Needed: A Pick-Me-Up! Your real name isn't Ginny Marie? I feel…so cheated. 🙂 Just kidding…Hey, we do what we have to do for our writing, right? I never picked blog names because when I started I was too naive to know I should and then, well, the names were there already so I gave up on even trying…. Wow, I never knew that wasn't your real name?!? That's too funny but I get the need for privacy. When I started blogging, I didn't think anyone would ever read so I used all of our first names…But watermelon, yum. Sorry but yum. Do your girls like it? Your very welcome. I love lemon and lime too! I had two wonderful prenancies, no stretch marks, no morning sickness, I loved being pregnant. I have the scares too!Pastor's daughter, I always wondered what that would be like and always felt it must be wonderful. Let's go have a margarita! Thank you for your visit. I've been thinking about using an alias myself, but I can't keep it up for more than a few weeks, so I didn't bother.About the knitting: it should say on the yarn label what size needles are best and what the tension is. When you are a beginner, I do suggest making a little try-out by knitting the amount of stitches for the amount of rows stated on the label. That way you know your own tension. I am a very loose knitter.When you use needles that are too small, it becomes very laborious and hard work to knit. Good luck! Hey! Beautiful blog. You have ADORABLE little girls! Thanks for the info on the blog button!Following now from BF.